Enjoy a curry? Our Christmas Foodie Market is opening up its hatches again this weekend, December 8th and 9th – we are looking forward to warming up with a delicious curry from Scotia Spice. Come along, enjoy sample pots made up by Yasmin McDonagh, founder of Scotia Spice. What can we expect from Scotia Spice this weekend? Well it’s December. People will be cold. We will be in the courtyard with something to warm them up. I’m going to be bringing a taster of our Tandoori Salmon and our Lamb Keema. How did Scotia Spice come about? I’ve always been a passionate foodie. I grew up surrounded by Punjabi cooking. My mother and grandmother were always cooking. Food is part of the fabric of our family. In 2006 when my youngest went to school I thought what now. I’d always worked in pension litigation but now I wanted flexibility. So I started a small cookery school. What did that entail? I started courses for three, in my kitchen. It was about getting people to look at spices, taste them and then cooking with them. It’s all about bringing different layers of taste through learning the expertise behind authentic Punjabi cooking. It’s easier to cook with spices when you understand them. 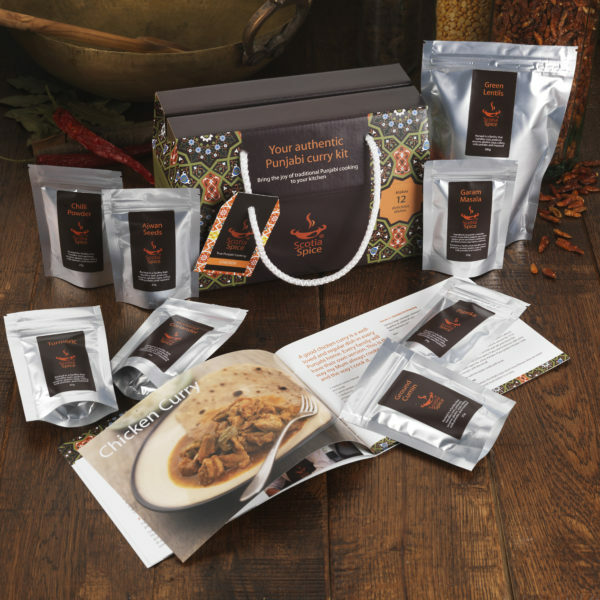 How did you go from cookery school to Scotia Spice packs? I thought about how I could put the cookery school into a box. I decided to try out my idea at a local Christmas fair in Stirlingshire. 11pm the night before I had 15 boxes prepared all complete with hand-wrapped spices. Within half an hour of the fair opening my 15 boxes were gone and I had a list for more. I sold 70 in the end. It grew and developed from that point on. Since then I’ve moved it on to smaller kits for people to try on a smaller scale. Little recipe kits. It’s had an unbelievable response. Best moments so far? 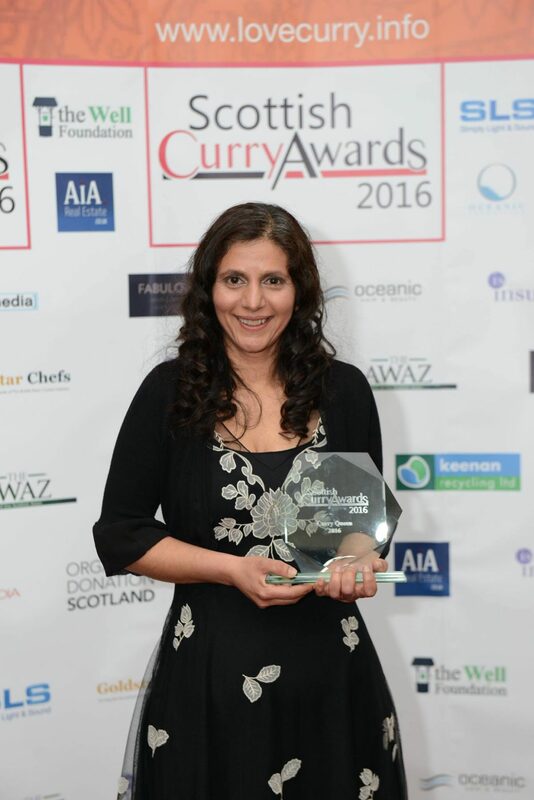 In 2016 – to my utter surprise – I won the Curry Queen Award in the Scottish Curry Awards. All I am doing is trying to show how simple it is, using simple methods, how the magic comes from the spices. What are the future plans for Scotia Spice? In 2018 I’ve started working directly with a spice trader. He goes back generations of spice traders – his uncle, his grandfather. Now I can source single origin spices. If I want a chilli powder from India I can select which one. For the first time I am able to make my family Garam Masala. I am hoping to market that next year. Make Restoration Yard your Christmas shopping destination this year. Every weekend you’ll find a pop-up mini festive foodie market with a selection of local artisan producers showcasing their favourite Christmas gifts to help you tick off your list. Alongside Scotia Spice, other producers include O’Donnell Moonshine, Buck and Birch. Plus, don’t forget to bring the car and pick up your Christmas tree – we have a selection of 5-8 foot stunning Nordmann Fir non-drop needle trees for sale. Also, this weekend you’ll also find a selection of local choirs performing their favourite Christmas songs. Find who’s on here.